The American Chemical Society (ACS) is a nonprofit organization chartered by the U.S. Congress. With main offices at Washington, D.C., and Columbus, Ohio, the ACS is the world's largest scientific society with more than 164,000 members. It is also a global leader in providing access to chemistry-related research through its multiple databases, peer-reviewed journals and scientific conferences. The highest honor the ACS can confer to an individual for distinguished service in the filed of chemistry is the Priestley Medal. This was established in 1922. This award is named after Joseph Priestley, the discoverer of oxygen. The ACS formed in 1876, spearheaded by a group of chemists who had met two years previously in Priestley's home. From 1928 to 1944, the Priestley Medal was presented every three years. After 1944, it became a yearly presentation. It honors individuals who are advanced in their fields, as it is intended to commemorate lifetime achievement. 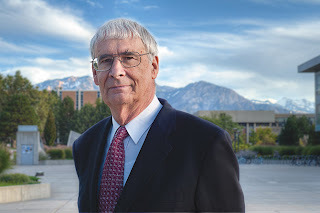 Peter J. Stang, Ph.D., distinguished professor of chemistry at the University of Utah and editor of the Journal of the American Chemical Society (JACS), has been named winner of the 2013 Priestley Medal by the American Chemical Society (ACS). It is the highest honor bestowed by the world's largest scientific society. The award recognizes Stang's cutting-edge research that has had far-reaching implications for many areas of science, including drug development and more efficient ways to produce gasoline and home heating oil. 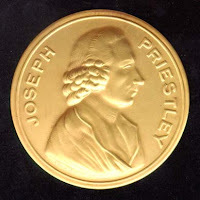 The annual award includes a gold medallion designed to commemorate the work of Joseph Priestley, who lived from 1733 to 1804, and is best remembered for his 1774 discovery of the gas that would later be named "oxygen." "Stang is a pre-eminent organic chemist with an international reputation and seminal, creative contributions to a broad spectrum of chemistry," said Gabor Somorjai, Ph.D., of the University of California, Berkeley. Somorjai nominated Stang for this award. Last year, Stang won a National Medal of Science, which is the highest U.S. honor for a scientist or engineer. He received the award from President Barack Obama in a White House ceremony, where he was honored "for his creative contributions to the development of organic supramolecular chemistry and for his outstanding and unique record of public service." Stang has pioneered the field of supramolecular chemistry, which is the study of how molecules come together and build new substances with complex 2-D and 3-D architectures. The molecules could have uses as drug-delivery vehicles and as key players in making oil refining faster and more efficient. "It's like a Lego set with individual building units," said Stang. "You can make complicated structures and systems." Stang has been editor of JACS, the ACS flagship journal, since 2002. As editor, Stang revitalized and enhanced JACS, culminating in an increase in citations and its Impact Factor. The most-cited journal in chemistry, JACS has received 408,307 total citations and has an Impact Factor of 9.907, as reported in the 2011 Journal Citation Reports® by Thomson Reuters. JACS is one of more than 40 ACS peer-reviewed journals. "For many years, Stang has been a force to be reckoned with in the ACS," said Harry B. Gray, Ph.D., who is at the California Institute of Technology. "He brought new ideas to make sure our flagship journal continues to attract the most important work in chemistry. He has done a fabulous job, and chemistry is better for it." Stang has mentored nearly 100 postdoctoral fellows and students, and has authored more than 450 papers. He has won numerous awards and honors, including election to the U.S. National Academy of Sciences and the American Academy of Arts and Sciences. Since 1923, the ACS has recognized groundbreaking chemists with the award.